5 Things to Give Up to Live Your Best Life. Sunny days in Portland, OR. Hey all! Long time no Blog. Adjusting to my new life in Portland, OR has been wonderful but also taken some time and energy to feel more fully adjusted to living in the United States more permanently again (after spending the past few years living back and forth between Europe -Spain, then Germany- and the US). I’ll admit, I have had both ups and downs as I’ve adjusted; to a new home, a new city, new career and being more independent again. But with each day I’m feeling more and more at home in this city, all while meeting new people, branching out into new communities, trying new things and trying to establish myself as a Personal Trainer in this active and amazing place. This new experience, and all my previous experiences of moving and living abroad, have each taught me something new, about myself and what I am capable of. But I will admit, I am an Overthinker and tend to question myself and my abilities, and often care TOO MUCH about what others think of me and what I am doing, which has lead to negative self talk. This is something I am Always actively trying to work past. And though not every day is easy, I am getting better about TRULY Believing in and Loving Myself, and letting go of trying to please everyone. I have kept this simple, yet profound list as my screen saver on my phone and written out posted on my wall, to remind myself Each & Every Day of these things and help myself live A Better Life. 1.Overthinking. 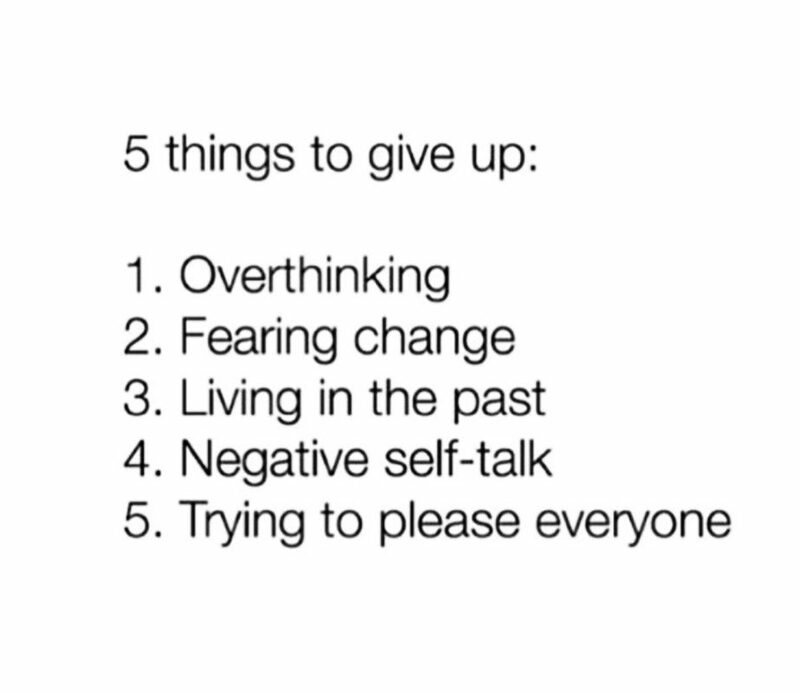 Of all the things on this list, this is perhaps (in my opinion) the most important thing to give up. So may of us tend to question what we are doing and saying, and how those around us are responding. We need to let it go and stop overthinking! 2. Fearing Change. We tend to get comfortable in certain things, which is not necessarily a bad thing. But don’t let that stop you from trying something new! Or branching out to chat with people from different backgrounds, and potentially meet new friends. 3. Living in the Past. We can learn from past experiences or we can let them consume us with “what if’s”, what if I had done that differently? What if I had done this? Done that? But EACH of those experiences brought us here today, helped teach us and shape us into who we are, or maybe taught us what we don’t want to become. I try to view every past experience as some type of learning experience, no matter how painful it may be, and let it all fuel me forward into becoming a better person and leading a better life. 4. Negative Self-Talk. YOU, above everyone else deserves your love and affection and kindness. If we cannot love and talk kindly to ourselves, how do we expect to be able to fully do that for others . My journey has involved a long road to self love and acceptance, and pushing past any type of negative self-talk, whether it was towards myself mentally or my physical appearance. I’m still working on it everyday, but each day I get a little better at pushing away those negative thoughts and replacing them with loving, positive, empowering words towards myself. 5. Trying to Please Everyone. WHY, why do we even want to please everyone!? Or have their approval? Shouldn’t we be happy that we are unique individuals being who we want to be and not worry? I understand it is easier said than done. During my time in the Social Media Fitness & Health World, I’ve constantly had to remind myself to BE MYSELF. I’ve had to take many breaks to re-evaulate my message, my journey and the way I share things to make sure I am doing so from a place of honesty and truth, NOT just to please and appease everyone. I’ve had to remind myself almost daily to “Be Happy. Be who you want to be. If others don’t like it, then let them be. Happiness is a choice. Life isn’t about pleasing everybody.” and with each day it gets a little easier to do so. This is just a small list but I encourage you to GIVE THESE THINGS UP, work on Loving and Accepting Yourself, and day by day learn to believe in yourself and your truth a little more. What is YOUR number one thing to give up to live your best life!? 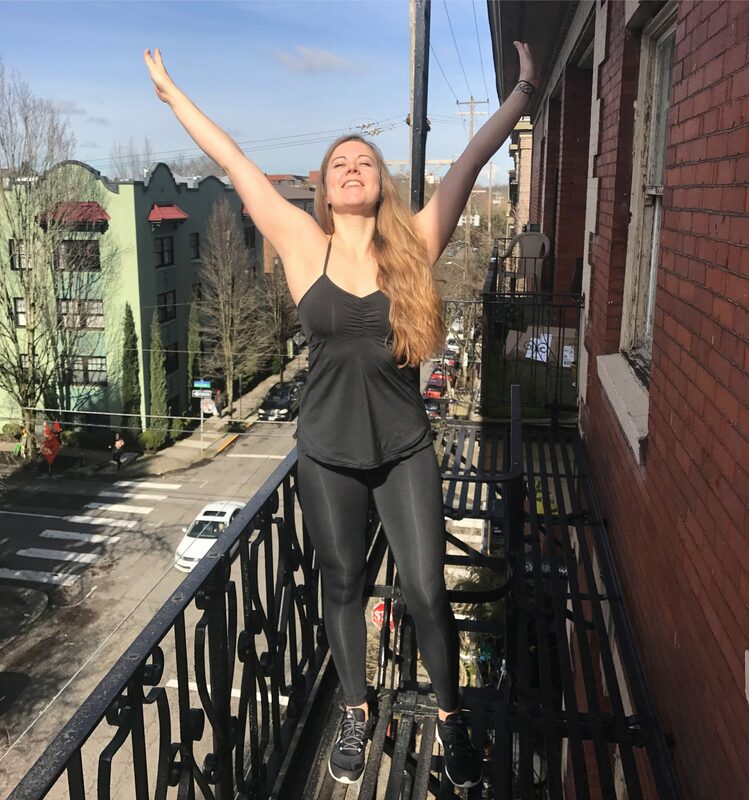 I'm Alena, a 27 year old fitness, health and language enthusiast, blogger and ACE Personal Trainer living in Portland, Oregon. Subscribe by email to receive notifications of my newest blog posts. The Whole 30 reset program, what it is and why is isn’t for me.. Right now.